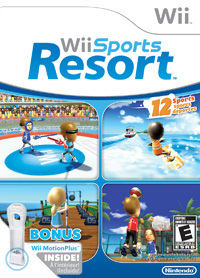 The Basic Idea: You’re at a tropical resort (in the form of your Mii, a Nintendo Wii avatar you create for yourself), surrounded by sunshine, turquoise waters and palm trees, and at your disposal are an array of resort-style sports activities you can engage in to challenge yourself and up to three of your friend. Or you can work together to a common goal. All in all, there are a dozen activities to enjoy. Who It’s for: Anyone who enjoys an island paradise (who doesn’t?) and the physical, skill-based fun that Nintendo introduced with its debut of the original Wii Sports collection. Rated “E” for everyone, this game is wholesome enough for any player, but requires some hand-eye coordination, making it potentially too challenging for toddlers and younger children. The Review: This game delivers on the original promise of the Wii—full-body, interactive gaming—with additions to and improvements on the original five Wii Sports games. Not only are the new games richer and more inventive, the play is more accurate thanks to Wii MotionPlus, an add-on to the standard Wii controller. MotionPlus’s higher level of accuracy makes the controller more responsive to smaller movements than the original Wii Sports, which required players to subtly adjust their natural movement to work within the confines of the remote. With the new controller, play is more realistic for games like Frisbee, swordplay, archery, basketball and wakeboarding. Other welcome evolutions include newer versions of table tennis, golf and bowling. One exception: Cycling, which requires you to “pedal” with your hands, which is exhausting and strange. The Bottom Line: We recommend this game for its surprisingly cool new controller and entertainment value. Wii Sports was neat, but it seems almost rudimentary compared with Wii Sports Resort. Better control makes it more compelling and a nifty island concept combined with more games keeps the suite interesting. The bundle of game with a Wii Controller equipped with the Wii Motion Plus will cost you around $50. The Wii Motion Plus is available alone, to retrofit existing Wii remotes, for around $20. The game disc features 12 activities, and each activity has a couple of different ways to play. Each player will need her own Wii MotionPlus.